Indulge in a remarkable player-friendly golfing holiday in Dominican Republic’s sublime Playa Bávaro. This Punta Cana golf course is located just twenty minutes away from the airport and is open for your enjoyment every day of the year. 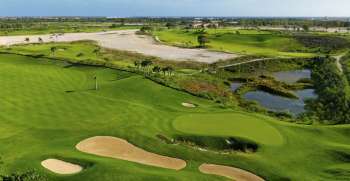 The Iberostar Bávaro Golf Club is a par-72, crosswind, 18-hole course surrounded by lush vegetation and marvelous panoramic views. Punta Cana is graced with an ideal and consistent climate, refreshing ocean breeze, and a clear sky; these conditions are optimal for a sublime golf trip. The veteran pro golfer P.B. Dye landscaped and sculpted this unique undulated design out of a flat terrain filled with stone and rock, transforming it into an amazing Caribbean course. The fantastic championship layout is set over 6,897 yards and offers memorable playing details such as lakes, streams, desert-like features, and even a beautiful cascade. The 105 white-silica sand bunkers provide players with an unforgettable visual experience, when in contrast with the perfectly manicured Supreme Paspalum green fields. The four different starting tees ensure a fun round for professional and amateur players alike.